Beat pudding mixes and milk in large bowl with whisk 2 min. Let stand 3 min. Gently stir in 1-1/2 cups Cool Whip. 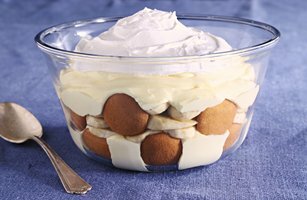 Cover bottom of 2-L glass serving bowl with 15 wafers; top with layers of half each of the bananas and pudding mixture. Repeat layers. Cover with remaining Cool Whip. Place unopened tub of Cool Whip in refrigerator for 4 hours. Do not thaw in the microwave.